I’m developing an aversion to washing my face over the sink. I think it’s because that (for the past few months) the sink has never been my sink, and I’m a bit tired of not being in my own house. It just never feels like the luxurious, relaxing experience that I want it to be. I’ve also been too squeamish about my C-section scar to have a bath (I have an illogical fear that the water will melt my scar and make it split open!) and I usually do my full cleansing ritual during my nightly soak so proper face-washing has taken something of a hit. I’ve reverted, for some of the time, and probably for the first time in over ten years, to a good old cleansing cream. Removed with warm, dampened cotton wool pads, so I don’t know why I can’t just go a step further and use a bloody flannel, but there we go! 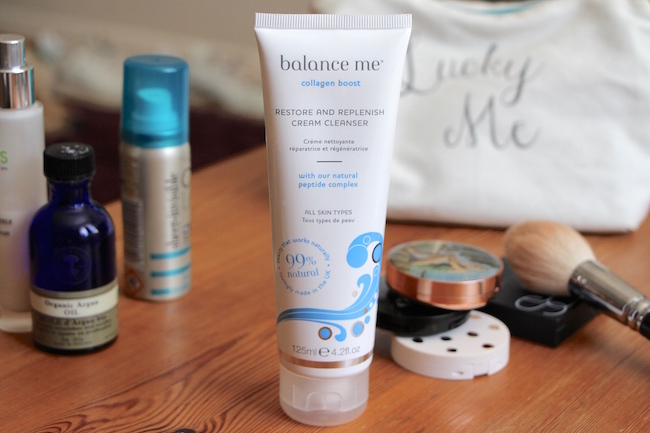 The creamy cleansing lotion that’s won me over: Collagen Boost Restore and Replenish from Balance Me. Brand new and promises great things; softening, plumping, anti-ageing, uplifting and soothing. The soothing one we can tick straight away – this is gorgeously calming and gentle and in terms of a “sensory experience” it feels and smells beautiful. The plumping and “prevents the signs of ageing” part is more difficult, because I’m always slightly wary of cleanser claims when they stay on the skin for so little time, but it’s nice when a product is well-formulated with the right stuff – better to have it in there than not, I suppose! The new Collagen Boost range (there’s a face cream too, though I haven’t got that) includes a natural peptide complex to support cells and give collagen production a little kick up the arse, then there are essential oils to variously uplift and plump. Nice. This is a sumptuous type of creamy cleanser, so not one of those wishy-washy lotions – you can get a good massage in before removing with cotton wool and (because it’s after wipe-offs that I always use some kind of water or tonic) sweeping with a toner. Or you can use as a flannel-off/Clarisonic-off/rinse-off cream – it’s easily robust enough and “gives good slip”, which makes it a nice multi-purpose cleanser if you’re looking for something flexible to pack in your holiday toiletries bag. Or, if you move house about seventy times a month, like me, it’s a good one to cart about with you so that you don’t need loads of different product. My skin has been on the dry side throughout pregnancy (it’s starting to get a little oilier now) and this felt comfortable where a few other cleansers left things a little taut, so a nice cleanser for dry skin or faces that are feeling a little fraught. Find it on Balance Me’s website here – it’s £18. Previous Post Sunday Tittle Tattle: Babies, Breasts and Scheduled Posts! Next Post Win: Very Special Edition Guerlain Terracotta Bronzers!